Optimal working dilutions should be determined experimentally by the investigator. Suggested starting 1:50-1:1000 dilutions for most fluorescent applications. Fig.1. DyLight fluorescent dyes are a new family of dyes with improved brightness. 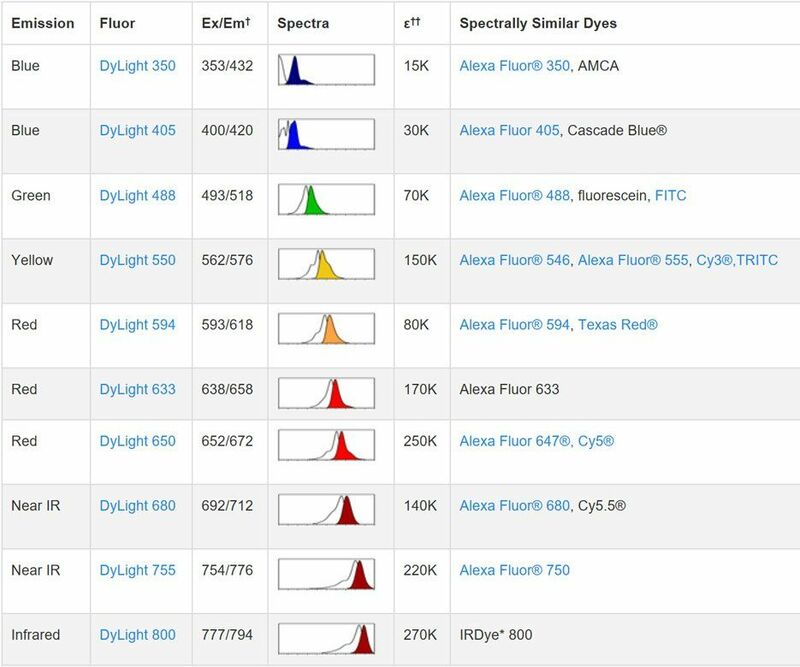 DyLight 488-antibody conjugates are brighter than Cy2 and FITC conjugates and similar in brightness to Alexa Fluor 488 conjugates. DyLight 549-antibody conjugates shows brighter influoresence than TRITC conjugates. Also, DyLight 594-antibody conjugates are noticeably brighter than Alexa 594 conjugates, and much brighter and more water soluble than Texas Red conjugates. Fig.2. 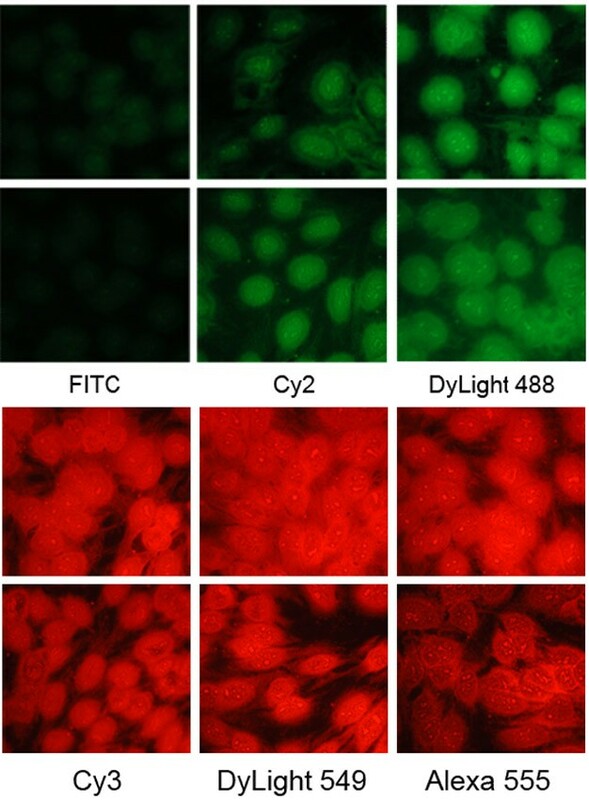 DyLight fluorescent dyes show improved photostability as well. 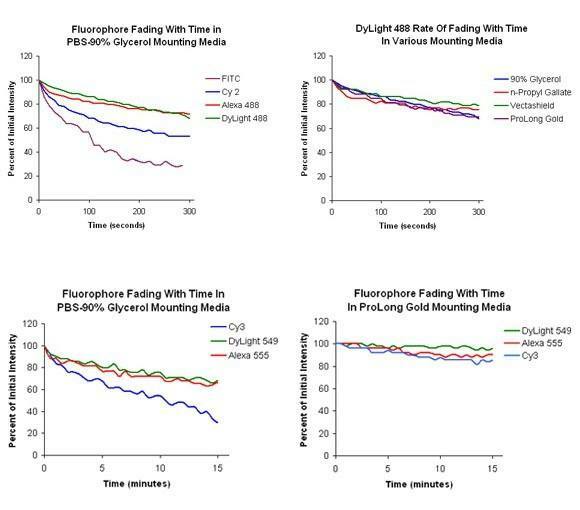 DyLight 488 conjugates fade less than FITC and Cy2 conjugates in mounting media indicating that the DyLight 488 molecule is inherently more photostable in epifluorescence microscopes. DyLight 549 conjugates are about as photostable as Alexa 555 conjugates and slightly more photostable than Cy3 conjugates. Fig.3. To use the DyLight Fluors with fluorescent imagers, use a spectral line of the blue laser diode for DyLight 405, a cyan (488 nm) laser for DyLight 488, a green (526 nm) laser for DyLight 550 and 594, and a red (633 nm) laser for DyLight 633 and 650. The DyLight 680, 755 and 800 fluors are compatible with laser- and filter-based infrared imaging instruments that emit in the 700 nm, 750 nm and 800 nm region of the spectrum, respectively. DyLight fluorescent dyes are a new family of dyes with improved brightness and photostability). They are better than or comparable to the best fluorescent dyes from other companies). The detection level of any fluorophore-antibody conjugate depends on brightness and photostability of the dye; antibody activity, specificity, and cross-reactivity; and the optimal moles of dye per antibody). A molar saturation curve vs fluorescence intensity, antibody activity, background level, and/or other parameters has been established for each dye to optimize the level of antibody detection and minimize background). DyLight fluorescent dyes are highly water soluble and remain fluorescent from pH 4 to pH 9). Liquid in PBS, pH 7.4, containing 0.02% Sodium Azide as preservative, 1% BSA as stablizer and 50% Glycerol. Abbkine secondary antibodies are available conjugated to enzyme, biotin or fluorophore for use in a variety of antibody-based applications including Western Blot, ImmunoHistoChemistry, ImmunoFluorescence, Flow Cytometry and ELISA. We offer high quality secondary antibodies from goat, rabbit and donkey sources for your each application. Serum adsorbed secondary antibodies are also available and are recommended for use with immunoglobulin-rich samples. The antibody reacts with whole molecule goat IgG. It also reacts with heavy chains of goat IgG, and light chains of all other goat immunoglobulins. It has no reactivity on non-immunoglobulin serum proteins, while it may cross-react with immunoglobulins from other species. Li C, Zhang J, Xu H, et al. Neuropharmacology, 2018, 1; 135: 151-162.